As one of Linda Chung’s (鍾嘉欣) closest friends, Leanne Li (李亞男) was one of the first people to know about Linda’s marriage to 41-year-old chiropractor, Jeremy Leung. Appearing as one of Linda’s bridesmaids at the wedding banquet on February 27, Leanne was spotted at the Hong Kong airport for her flight to Vancouver. Leanne’s husband, Wong Cho Lam (王祖藍), was nowhere in sight and will be unable to attend the banquet due to work obligations. Leanne will be staying in Vancouver for two weeks to help out Linda and visit her parents. Since Linda and Jeremy were married last year, Leanne was asked whether it was difficult having to keep Linda’s marriage a secret for so long. Leanne confidently replied, “Good friends need to keep each other’s secrets. Even my parents didn’t know!” She also managed to keep the secret from Cho Lam, until Linda eventually introduced Jeremy to them. Linda and Jeremy’s wedding banquet will be held at the Burnaby Riverway Clubhouse in Canada. Aside from Leanne, the bridesmaids also include Eliza Sam (岑麗香) and Christine Kuo (苟芸慧). Eliza already flew to Vancouver earlier to help Linda with the wedding arrangements. @kidd and @abc123a omg you guys just made me LOL!!! Toooo funny!!!!!! 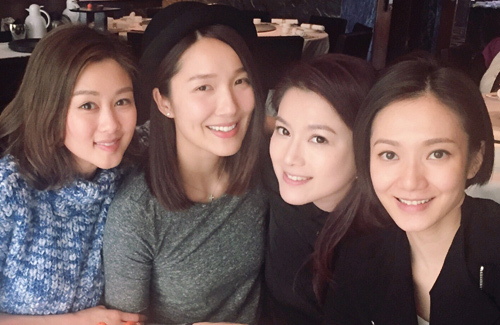 among the 4, eliza sam and christine look good without makeup. It seem like most of Linda friends are Christain. I wonder how come Leanne still can be the bridesmaids since she’s already married. I have heard the Chinese way once you’re married you can’t be the bridesmaids? Correct me if I’m wrong. I’m sure Eliza are happy to be in Canada right now because her boyfriend is from there too. Poor WCL can’t go with his wife. how come all of them face got a v-shaped chin?